How do we know when to give up? To many, "quit" is a pejorative term. Yet some challenges are insuperable, and while failure may be heroic it is rarely inevitable. I'm going to stray from the Churchillian "Never give up..." to consider the question "Under what circumstances should one consider giving up?" The greatest dilemma facing anyone pursuing a goal is often whether and when to quit. Should you stick to your guns or reach for the white flag? I'm going to explore that dilemma with a little help from Max Weber, Winston Churchill, Martin Luther King and Aung San Suu Kyi, and with poetic contributions from Robert Graves, Rudyard Kipling and Arthur O'Shaughnessy. 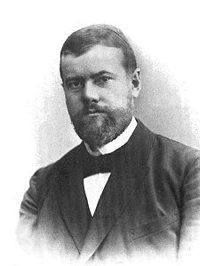 Max Weber wrote in Politics as a Vocation that success in politics depends on Passion and Responsibility. I think that these two qualities are important for us all, whether we are politicians or not, and that they provide the framework for assessing when to persevere and when to decide that the better part of valour is discretion and call it quits. Passion about a cause or an outcome is the common characteristic of successful people. In fact it's a necessary condition of success (the only alternative is pure luck, like winning the lottery or accidentally discovering a cure for a terrible illness). Passion provides the focus, the mission, the goal sought, and protects and compensates us for the hardships incurred in its pursuit. Responsibility, particularly in a leader, involves an understanding of the consequences of the passionate pursuit of a goal. These consequences can extend far beyond the group of people choosing to be involved with the endeavour, and a responsible leader considers the interests of all stakeholders, including those without a voice. When leaders do not afford proper weight to the interests of others, their actions can sometime be described with euphemisms like negative externality and collateral damage. 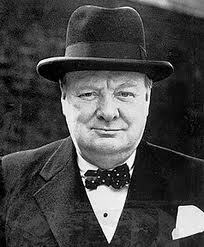 In May 1940, Winston Churchill took over responsibility for the fight against Nazism. He certainly had the passion to commit himself and all the resources at his command - the whole of the British Empire and all its influence with allies - to the task. But as John Lukacs describes in Five Days in London: May 1940 Churchill himself was careful to pick his battles, entering the fray only when the Chamberlain Government was imploding, delaying the Normandy landings to the fury and cost of Russian allies, and recognising that a quick extraction leaving enduring chaos in the Balkans was a worthwhile price to pay for tying up 20 German Divisions (for more on this see Eastern Approaches by Fitzroy Maclean). Choosing the moment to give up is a vital skill for a leader which is most easily assessed with the benefit of hindsight. Once the outcomes are clear, it's usually easy to see when the time came to quit. The key customer left, the intellectual property was compromised, the vital team member left, essential resources ran out etc. Was there a more responsible way? When we look back through history it is straightforward to pick out the people who chose the best course, but as Churchill himself demonstrated when he set out to write the record of the history he had previously played a part in creating, the victor's perspective may not provide the whole picture. Though they had no taste for Nazism, Lord Halifax, RAB Butler and others at the heart of the establishment advocated negotiation with Hitler after the fall of France, and if they had successfully contained Nazi expansion it is at least conceivable that the total global cost of the war might have been lower - or perhaps lower to the British Empire. While Churchill's passion was remarkable, he accepted some costs - on behalf of others - which with the benefit of hindsight some might argue were irresponsible. For example in the short term, he agreed to send 50,000 Cossacks to almost certain death at the hands of Stalin, and allied policies in the Balkans fueled the fires that still burn there today. We shall fight on the beaches, we shall fight on the landing grounds, we shall fight in the fields and in the streets, we shall fight in the hills; we shall never surrender, and if, which I do not for a moment believe, this island or a large part of it were subjugated and starving, then our Empire beyond the seas, armed and guarded by the British Fleet, would carry on the struggle, until, in God's good time, the new world, with all its power and might, steps forth to the rescue and the liberation of the old. This is fantastic rhetoric, and it is the product of exceptional times. Few individuals, organisations or modern states face such an existential threat, and few have to contemplate such sacrifice. For most of us, it should be easier to balance passion with responsibility. One popular method for assessing performance is benchmarking. By comparing our performance to those of a set of suitable peers, we are able to establish which norms, or averages, we are straying from. This can prove a helpful device for reviewing the performance of a manufacturing process, or an infantry company, or even a personal relationship, but does benchmarking help you decide what price you think it is worth incurring in pursuit of your goals? Benchmarking is not prescriptive. While we may aim to make our manufacturing process faster than our peers, benchmarking does not tell us how to. It may help us to identify problems and improve our performance to the norm, but it will not lift us above this unless we try something non-standard or take risks others reject. Thus Churchill's decision to stand alone against Nazism would almost certainly have failed a benchmarking test. Even allied French Generals warned their Prime Minister just before the fall of France that "in three weeks England would have her neck wrung like a chicken". Another of history's great orators, Martin Luther King faced a similarly implacable foe - embedded civil injustice and racism that had taken root for hundreds of years. But unlike Churchill, Dr King had no empire to call upon, only the power of rhetoric. For him responsible leadership was built on the non-violent ideas of Ghandi. He incorporated the words of the US Constitution and the ideas of Abraham Lincoln into his famous "I have a dream" speech of 1963 in order to make common cause with the values of his oppressors and, like Socrates, gently to point out to them the inconsistency of their own behaviour. I would like to live a long life. Longevity has its place. But I'm not concerned about that now. I just want to do God's will. And He's allowed me to go up to the mountain. And I've looked over. And I've seen the promised land. I may not get there with you. But I want you to know tonight, that we, as a people, will get to the promised land. And I'm happy, tonight. I'm not worried about anything. I'm not fearing any man. Mine eyes have seen the glory of the coming of the Lord. He was assassinated the following day. By the time of Dr King's death, much of his dream was coming true. Though he had called for revolutionary change he was able to do so without irresponsibly exploiting tension or provoking violence. 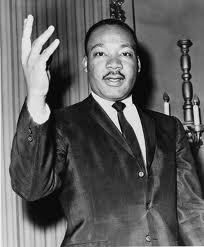 Though he criticised injustice he focused his passion on an outcome that was better for all - in which all would benefit. In so doing he balanced his passion with a responsibility for all stakeholders whose lives would be influenced by his ideas - his dreams. He was fortunate enough to live in a country that was willing and ready to change. Not everyone is so fortunate. Then . . . but there comes a brazen clink. Goliath's shield parries each cast. Clang! clang! and clang! was David's last. Says foolish David, 'Damn your shield! Come filching lambs from Jesse's flocks. Throws blindly foward, chokes . . . and dies. When a responsible assessment of one's power indicates unbeatable odds, it's time to quit the field - or try adapting your tactics. If the odds you face are insuperable with the resources at your disposal, there is of course an alternative to accepting defeat. As any student of modern military thinking knows, the question "Is my goal still the right goal?" should always be kept under review, since circumstances can change. As John Maynard Keynes put it "When the facts change, I change my mind. What do you do sir?" Have you reviewed your goals recently? What are they? Alternatively, or in addition, you can adapt the means by which you pursue your goal. While Churchill called on the might of the Empire and its allies, King followed Ghandi's approach of non-violence and turned the oppressors' own values against them, referring to the US Constitution, Lincoln's Emancipation Proclamation of 1863 and the Bible to establish the justice he sought. 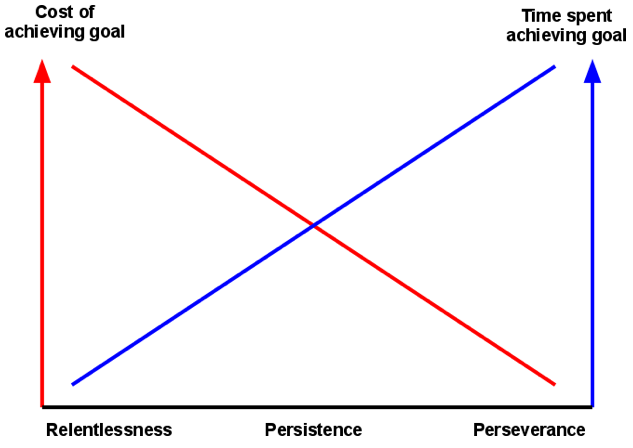 Are you using the right means to achieve your goals? There is a hierarchy of tools available to the goal-seeker. They may become relentless, metaphorically banging their heads against a wall until it crumbles. This is impressive to watch and can yield quick results, but is often costly and inefficient. "Relentlessness" is as often used as an insult as a compliment. Persistence is another matter. It suggests a degree of adaptability, a willingness perhaps to tackle the wall with power tools or to look for a ladder. Subtlety plays a greater part and slower results may be won at lower cost. Finally, perseverance is the willingness to find a way around the wall, or to find one's goal this side of the wall. This approach requires the greatest patience and may eventually yield results at the lowest cost in resources other than time. For those for whom violence is not an option or a preference, this is the most important tool. To be responsible a leader must also weigh the risks they may incur for themselves or others in pursuit of their goals. It can help to plot the probability adjusted value of an outcome against the cost of its pursuit. 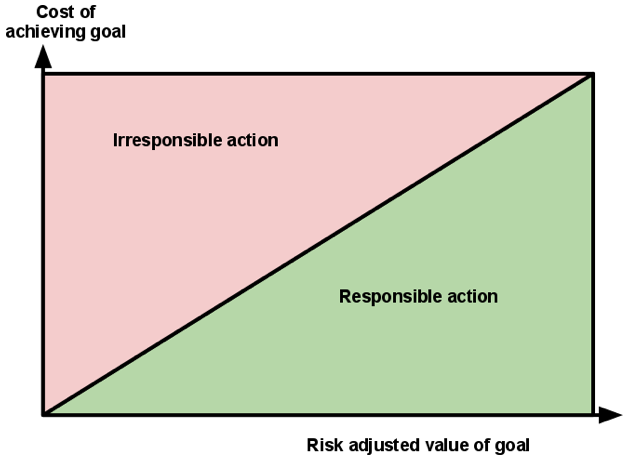 If the probability adjusted value (the value of the outcome discounted by the probability of its achievement) is lower than the cost, it would be reckless and irresponsible to pursue the goal. Among others, beware of the psychological risk of aiming too high in an unconscious attempt to make failure acceptable. This is an irresponsible form of leadership identified and explored in On The Psychology Of Military Incompetence by Norman F Dixon - a great read even for those with no interest in the military. 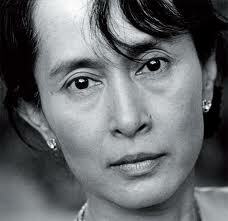 Aung San Suu Kyi has been the rightful leader of Burma since winning an election in 1989 with 59% of the popular vote. However, since then she has spent nearly 15 years under arrest. She was offered freedom if she left the country but refused. Between 1989 and 1999 when he died, she saw her husband only 5 times, most recently in December 1995. She continues to refuse to leave Burma for fear that she will be prevented from returning, and her family is repeatedly denied visas to visit her. Her two children remain in the UK. The Burmese military Junta continue to hold power. For Aung San Suu Kyi, the most responsible course is to maintain the non-violent path of Ghandi and Buddhism and minimise the risk to her movement from the brutal Junta, while bringing the full moral force of her dream to bear using every method at her disposal. Her agility in adapting to the communications revolution and commanding the attention of world media is famous, but it is always tempered by care not to provoke violence. In the face of such brutal treatment her responsible pursuit of a dream is all the more remarkable. If we were to weigh moral power against violence averted, I suggest Aung San Suu Kyi would be one of the most outstanding leaders of our time. I hope her dream comes true, and I believe it will. Aung San Suu Kyi's example shows that even without the might of the British Empire, or the support of the US constitution, and when held at gunpoint or under house arrest, there is no need to quit. By all means adjust your goal if circumstances change, and be willing to change your tactics too, but you too need never give up. But remember, quitting your course is the most responsible thing to do if the probability adjusted value of the goal is lower than the cost. No benchmarking exercise would have produced a Winston Churchill, a Martin Luther King or an Aung San Suu Kyi. If you wish to live an average life, rising with the tide of human progress, then benchmarking yourself against your peers is the right approach. This post formed the basis of a presentation to the NHS Staff College. I was one of two speakers, following Major General Mungo Melvin who spoke on Strategy. In the 'World of Medicine' I work as an Eye doctor & surgeon. I fight for my patients to save every last bit of vision. I never 'give up' and moreover, I would expect any doctor treating me to do the same if I was their patient. 'To give up' is therefore something which is equivalent to 'failure' in my life. Something which is a sign of weakness or lack of ability........Working in the NHS is a whole different ball game. Ben's inspirational lecture at the NHS Staff College along with the remainder of the leadership course, lectures & discussions, most capably led by Steve Andrews, Brigadier Mostyn and John Mackmersh has made me understand when it is 'OK' to 'give up' and how & when to have the courage to rightly do so. It most certainly saves valuable time and energy, and there is no shame in it. I now have a new perspective. Thank you Ben!